Last week we looked at Cindy’s beautiful Holyoke, Mass., home – photos I took last summer. Today – we get to see the updates that she made to her bathroom vanity and tile floor and shower over the winter – she replaced the laminate on the bathroom vanity in a lighter ‘beigewood” shade, and also retiled her floor and shower stall. Cindy’s updates are incredibly well done – she has a great eye for detail and I know that she labored over each little decision…. Great inspiration and ideas, I am sure, to many retro renovators looking for a way to update their tired bathroom vanities, in particular. 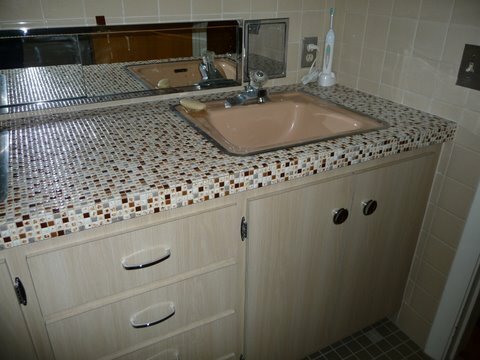 Since you were here I redid the tiles and laminate cabinet in the bathroom…. 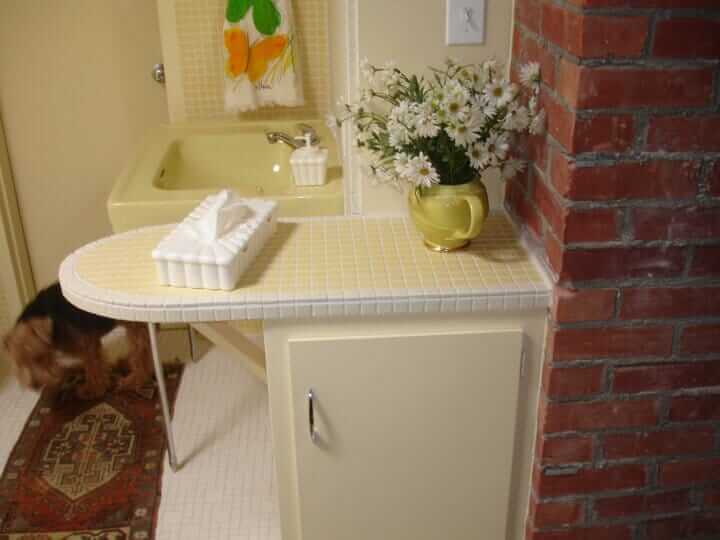 Fiorella Cosgrove of Cortina Tile in West Springfield, MA was the only tile advisor who “got” my desire to be retro and I could not have done it without her and highly recommend them. (Corina Tile;1645 Riverdale St.; West Springfield MA 01089). The old laminate was stripped off and replaced with Wilsonart laminate-the color is beigewood #7850-60. The hardware was purchased at Re-Store for a super awesome $10. I also got a new soap dish to match the existing ones – that came from ebay and it is the Hall-Mack polished chrome …Coronado series. A local hardware store with 50 years of old inventory provided me some items from the same line and of course I have extras…even a towel rack I couldn’t resist and haven’t used yet. 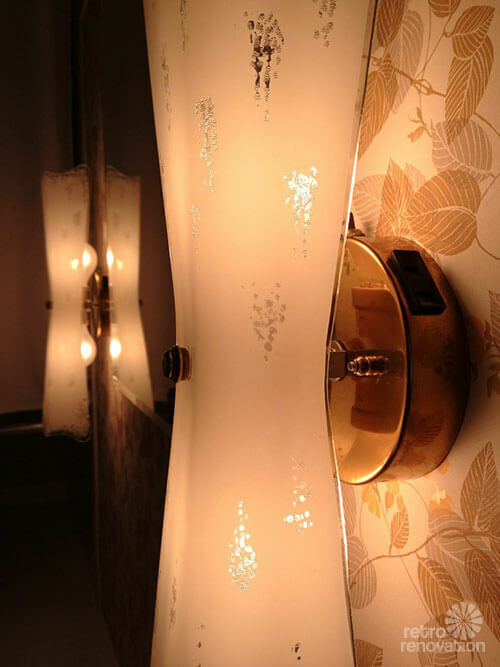 The bathroom pendants are original BUT the canopies were brass – I found a local guy to chrome them for me so they would match all other metal in the bathroom. the toilet, sinks, and tub are original. I’ll be looking to replace the Church toilet seat very soon if I can find the same color. 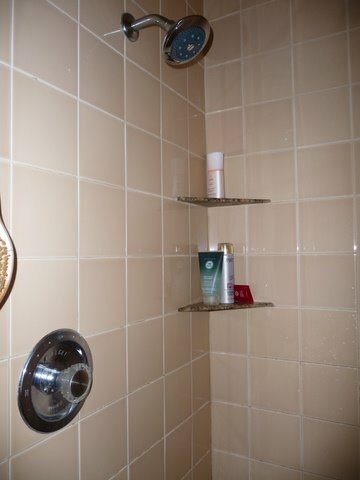 The shower tiles are 6″x6″, made by Original Style in England, color is Ecru. The floor tiles are 2″x2″ Dal-Tile color is elemental tan with sporadic 1″ x1″ tiles color urban putty. (Size created by tile installer by cutting 2×2 tiles in quarters…this give extra texture and was recommended by Cortina Tile). Help! I just closed on my new 1964 fixer-upper yesterday. 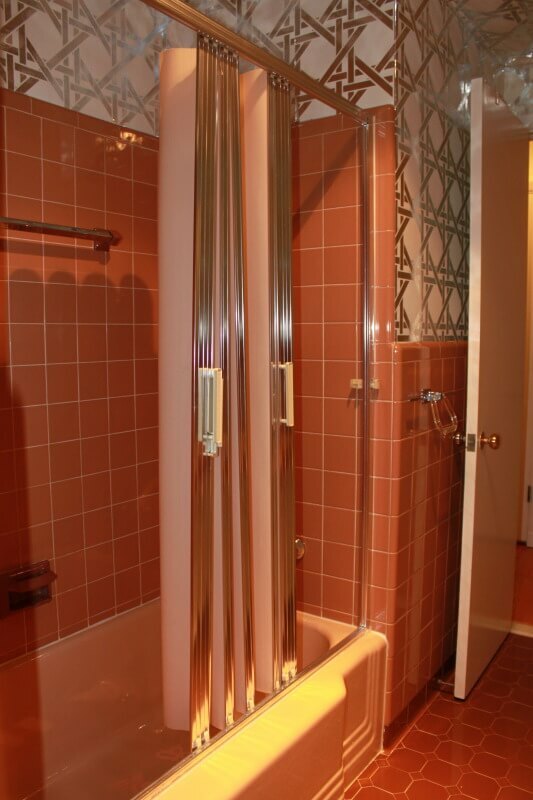 My awesomely pink bathroom (which I love) has this same mirrored in-wall swivel toothbrush holder. Unfortunately, mine was not well cared for in the past and will either need to be replaced or refinished somehow. The mirrored surface is not as bright and shiny as I would like. Any ideas on where to find one or how it may be restored?? Great job re-doing a bathroom, tearing out some old stuff, but putting new stuff in that is even better (without being too…..”HGTV moderne”). It looked good before; looks even better now. 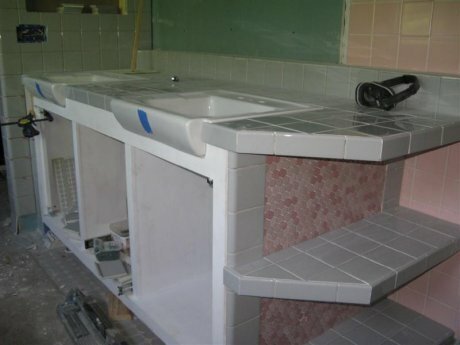 I know that many lovers of vintage, and purists, hold that one can never tear out original tiles/fixtures/etc. but someone should coin a term for when you tear out the original, but you replace it with other vintage or vintage-looking, that is even better. Re-vintag-ing? I dunno! I leave it to you! Barclay, I think that would be called a “Retro Renovation Upgrade”…! Me and my husband just bought a house that was built in 1954 or maybe 1958. I can’t remember the exact year. I was hoping you can give me some ideas as to update the house but still keep the 50’s style but just with a modern touch. The color of the bathroom is black and yellow tile on the wall and all over. I took pictures of the bathroom for better idea. I hope you are still reading this site. I just bought a home with a yellow and black tile bathroom as well. Wondering what you ever decided to do with yours as I am not sure what to do with mine? Cathy – congratulations and welcome! 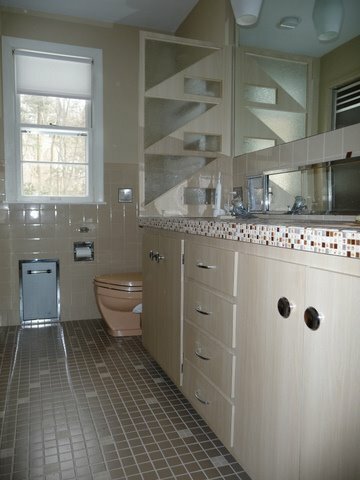 Aqua and rich brown wallpaper and/or accents look great in “suntan beige” bathrooms – I have one myself! Wow. I wish my bathroom was that large! Looks wonderful.